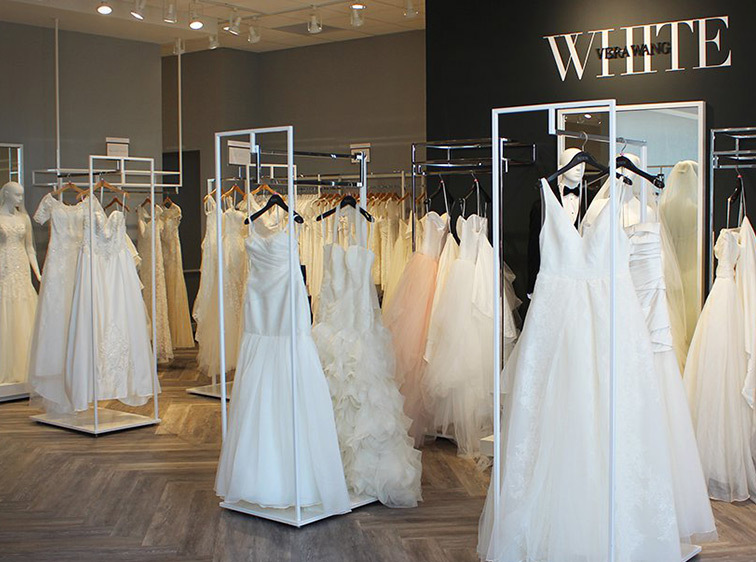 Our SVP of stores, Heather D’Agosta, shares the ins-and-outs of bridal appointments, so you know exactly what to expect. 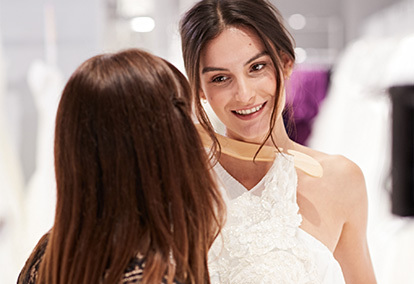 We asked Heather, our head of stores, to answer some of the most frequently asked questions we hear from brides as they embark upon their dress-shopping journey. While some weddings take place within a few weeks, the average engagement lasts six months. 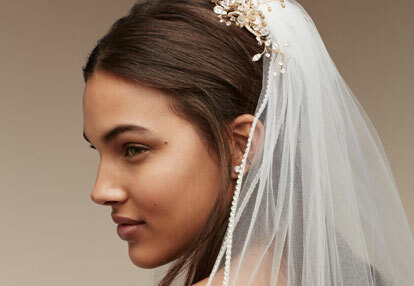 We will meet any deadline you have—and help you customize your look for the most important day in your life. A: If you want a quieter experience, try to schedule an appointment during the day, Monday through Thursday. These are our quietest times in the stores, and we are able to offer our brides as much attention as they need. If you choose to visit us on the weekends—I really can’t stress this enough—make an appointment. We can do a better job when we are expecting you! Also, tell us how many people you are bringing along so we can better accommodate your fitting area. We recommend bringing your two most trusted friends or relatives to help you make the decision. Of course, we understand if you want to bring more—just let us know. 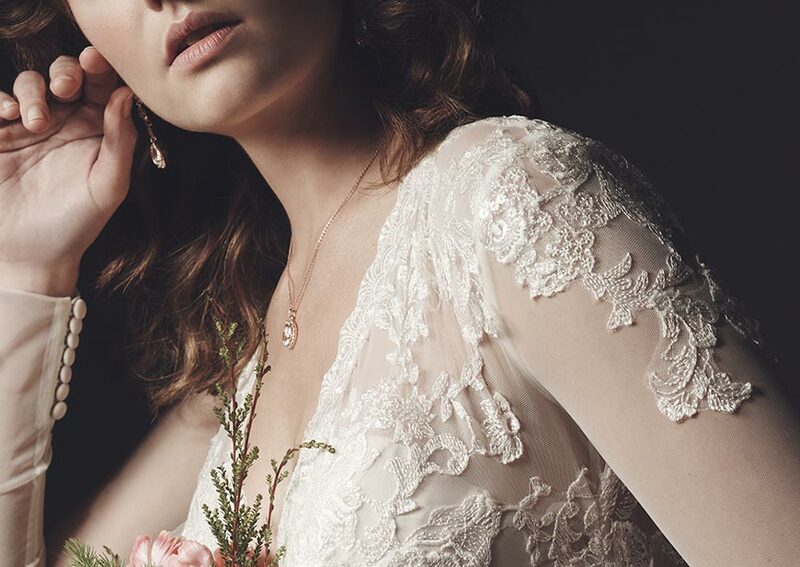 Our bridal appointments are 90 minutes long, and our stores have flexible hours to meet every schedule. A: I highly recommend making a wedding dress appointment. For most brides, this is the single biggest purchase they’ve made in their lives so far. We want to ensure you have all the support you need to make that decision, and an appointment helps us to provide you with the best possible service. It takes 100 hours to create a David’s Bridal wedding dress. Buying a wedding gown is much different from buying a dress at your favorite store. A typical wedding dress takes 100 hours to create and may be embellished with beads, lace, sequins, and more. Because these highly detailed gowns are heavier than what you are used to wearing, they require extra assistance when trying them on. Also, while knowing your size is helpful, it doesn’t always translate exactly to a wedding gown. Our well-trained stylists will help you choose a dress and suggest lingerie or foundation garments that complement the dress and accentuate your figure. Then, our alterations experts will make sure you get a perfect fit. Finally, it is important to note that almost every wedding dress will have to be altered. During your appointment, our alterations experts will spend time with you to ensure a perfect, just-for-you fit. A: Of course! Shopping for a bridal gown is just like your wedding—it is all about you and should reflect your personality. Some brides like to bring their friends and others like to go shopping by themselves, especially if they already have a clear idea of what they want. We help many brides who choose to shop by themselves. We have expert stylists to assist you with your decision, and they will ensure that you walk out of the store confident, with the look that’s right for you. 90% of our wedding dress styles are offered in sizes 0 – 30. A: Here is where I get to talk about what is especially great about David’s Bridal! We carry more than 120 styles in every store, and most of our styles are available in sizes 0–30. If we don’t have the exact style and size you want, we know that we can find something similar in the store that is representative of your vision and inspiration. We recommend coming in to try on dresses to determine the appropriate size for the style you pick out.  But if you want a special style or size, we would be delighted to order it (please note, this takes about eight weeks on average). We also have beautiful gowns that you can take home the same day. 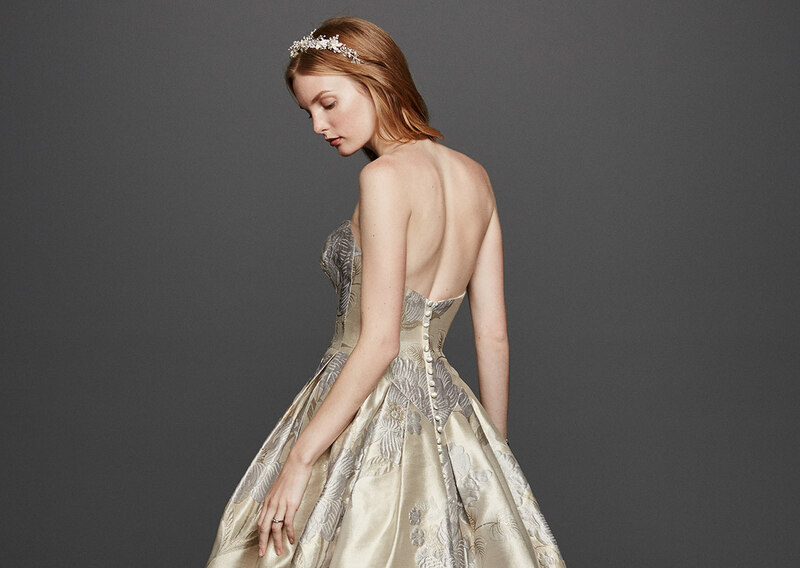 A: Your dress will be unique because you are unique, and it will suit you in every way—your inspiration, your style, your personality. But there are other ways to ensure that your dress is truly yours. For instance, we can add sleeves to sleeveless gowns, or add one of 14 different kinds of bustles. Another way to customize the look of your gown is with accessories. We offer more than 100 veil styles, and different lengths change the look and feel of the dress. I worked with one bride who added a cathedral-length veil—meaning, it trailed on the floor—to her short dress for her courthouse wedding! It suited the bride and her event. A: Every bride and bridal party is different, but there are a few constants when shopping for bridesmaid dresses. 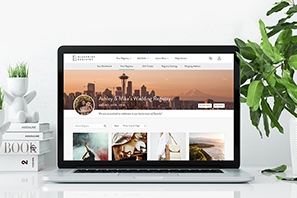 If you prefer to shop with them at the same time you shop for your gown, I recommend booking two appointments, one for your bridal gown and another for bridesmaid dress selection. We offer 2,500 bridesmaid dress options through mixing style, color, and fabric. Some brides prefer to shop with one bridesmaid, choose a dress for the bridal party, and instruct the rest of the members which dress or dresses to order afterwards, either in-store or online. We recommend a store appointment for bridesmaid dress selection so your stylist can help you pick out the style, fabric, and color, then work with you and your party to ensure everything is ready in time for the event. After you’ve chosen the overall look, your bridesmaids can come try on dresses and find their sizes at any store when it’s convenient for them, no appointment necessary. Since some styles will need to be special-ordered or altered, we recommend choosing the dresses for the bridal party as soon as you can. 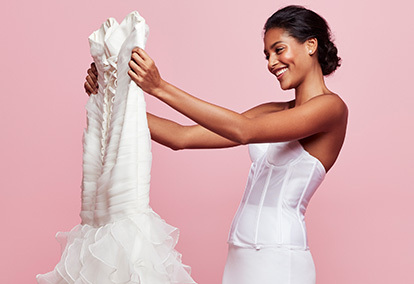 The good news is that David’s Bridal has plenty of inventory—so no matter how much time you have to plan, we can get the right look for your event and your party!